Can’t get enough of Portal 2? Well, you might want to check out a technologically advanced tablet known as the iPad 2, and have it go along with the $29.99 Portal 2 Aperture iPad Sleeve to boot. 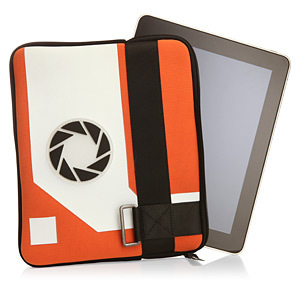 Yes sir, this is an officially licensed Portal 2 product, and it will play nice with both the iPad and the iPad 2. Available in an orange color to match Chell’s jumpsuit, it makes perfect sense to protect your iPad or iPad 2 against any damage, since you will need to return it after testing – or touch wood, you meet your Maker due to an accident, at least keeping the Apple tablet safe from knocks and scratches makes perfect sense. There are also black and white details thrown into the mix, including the Aperture Laboratories logo so that everyone around you would know what a huge fanboy you are. A rubberized grommet is also included so that you can snake your headphone cord through in order to listen to your favorite MP3s while working. Seems to be the perfect gift for an iPad 2 owner this Christmas, no?